We ranked 13th in QS EECA! QS EECA Ranking Released: Sabancı University is 13th. UK-based higher education ranking QS revealed the Emerging Europe and Central Asia – EECA Universities Rankings. 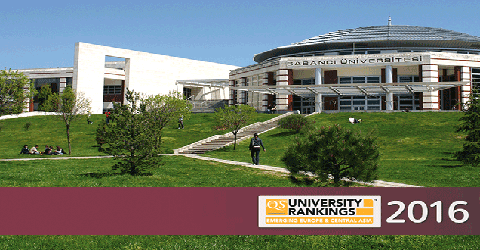 Sabancı University gained one position compared to span8 year and became 13th among the “Top 200 Universities." The QS university rankings for Emerging European and Central Asian nations are assigned different criteria depending on region, which differentiates the EECA Rankings from the QS World University Rankings. Sabancı University became 13th among the “Top 200 Universities” from 21 countries. 16 Turkish universities were included in the “Top 150 Universities” list compiled span8 year, but this year’s edition revealed 20 universities from Turkey in the top 200. Also included in the rankings were Boğaziçi University in 9th place, Bilkent University in 12th, METU in 14th and Koç University in 16th place. Differently from the QS World University Rankings, “staff with a PhD”, “citations per paper”, “papers per faculty” and “web impact” were the factors included in the assessment, while “citations per faculty” was excluded.